I have had many job titles and descriptions over the years, but creative problem solving is what I enjoy the most. My solutions have taken the form of web sites, apps, events, books, talks, systems and products. radiCOOLS are fun, custom-designed wearable accessories for boys and girls. As a way to express and display their interests, radiCOOLS’ collectable nature also gives kids social currency and can build conversations about your brand as kids share and swap accessories with friends. It doesn't matter what you experience if you don't take the time to reflect on it and learn something. Find patterns in their best and worst days. Find out what they have been thinking about the most for the last day, week, month, year, etc. It's called PROCONist because it represents your input based on the Pros and Cons of your day. I founded one of the premiere illustration destinations on the web. I conceived, designed and programmed a custom content management system to accommodate publishing news, sort ranking illustrators, site registration, and a searchable XY Q & A database. I also conducted interviews with over 100 illustrators, designers, art directors and art reps. This site was created as a fun destination for Art Directors, Designers, Students and people who just love lettering and typography. I designed and developed a custom content management system to handle sorting, ranking, comments, registration and more. see a demo of something similar on my site. I created a site to encourage kids and playful adults to exercise their creative muscle. The site included free downloadable creative classroom activities and an online gallery where participants could share and view ideas from other "creACTIVISTs"
As the Founder of the creACTIVIST platform, I have had the pleasure of visiting schools in Argentina and Brazil to motivate and facilitate school children and university students in their creative problem-solving skills. I continue to write and illustrate picture books and board books. It has always been important to me to engage with, motivate, energize and inspire young creatives with things I have learned along the way. I have been fortunate to be presented with the opportunity to give talks and conduct creative workshops at universities, companies and events around the world. Cornish College of the Arts - Seattle, Society of Illustrators – New York City, ILUSTRAFIC - Valencia, Spain, University of Buenos Aires - Argentina, Computer Arts Show - São Paulo, Brazil, American Greetings - Cleveland, Ohio, OFFSET - Dublin, Ireland, Puma Street Arts Festival - Buenos Aires, Argentina, Pixelation - Cordaba, Argentina, Cliche Arts Festival - Bahía Blanca, Sid Lee - Montreal, Canada, and more. Talk at Society of Illustrator NYC. Watch the video. I have had the honor of being invited twice to judge the highly prestigious ADC Global competition with entries submitted by some of the most respected art directors, designers, illustrators and creative agencies from around the world. 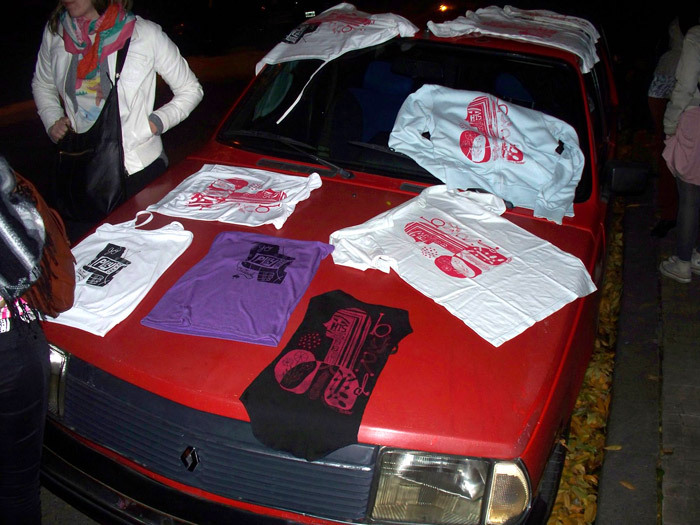 The PARK BENCH silkscreen party was an event organized by me and Turbo Galeria in Buenos Aires, Argentina. Participants brought anything they desired to be silk screened live (mix colors, mix screens, get to know your neighbor) and yes my art was printed on someone's underwear ... right where it belongs.